The healthcare industry is another industry where these plastic storage bins come in very handy. From the ER to the OR, storage and efficiency is always critical in hospitals, doctor’s office and pharmacies. Stackable bins and containers are a safe and helpful option for holding your valuable supplies or belongings. Whether you need stackable bins to hold your personal items or for work, they are guaranteed to help you with your organization issues. We have the most complete selection of stacking containers available. Each of these bins and containers are available in different sizes and colors. Stackable bins are water, rust and corrosion proof. There are many different styles of stackable storage bins that are readily available. You can get stackable bins with lids, stackable bins that can also hang, stackable containers that have multiple divider slots and many other options as well. 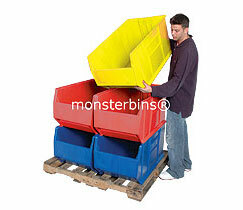 For warehouses and larger storage items, there are stackable bins that range from 24″ deep to 42″ deep. 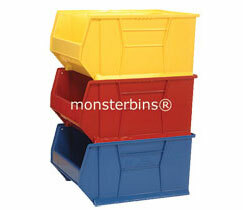 These bins are extremely heavy duty and can be used in almost any setting. Our giant stacking containers are very heavy duty and they have a wide opening in the front. This opening is designed to give you easy access to the parts and supplies that are inside. They can be stacked up as many as 6 high. They also are made with label holder slots so you can clearly identify what is in each giant stacking container. These containers are made in 3 sizes and multiple color choices. You can even get giant stacking containers with wheels on them to give you a mobile storage bin. Each container can hold up to 100 lbs. 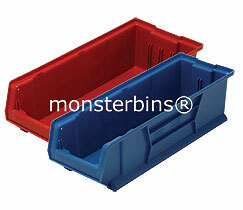 or Purchase Stackable Plastic Storage Bins from Monster Bins now!